From our church’s very beginnings on University Boulevard, it has been our dream to own the entire city block in order to provide a sanctuary of hope for the city of Birmingham. Over these last nearly 50 years, master plans have worked around our neighbors – Southern Research, Johns-Ridout’s, and Cat Haven – whose borders have encroached upon ours. One by one, we have been able to secure our future with the purchase of adjoining property. With the church’s vote on Sunday, October 14 that dream of owning this city block is becoming a reality. Our future has never been brighter! We are poised and ready for the next 50 years of ministry in Birmingham. To fully realize this dream and make it a reality, however, takes commitment. We know this story. After all, it was “the company of the committed” who began this church in 1970 with nothing – not even a paper clip – and look where we are today! But now it’s our privilege to demonstrate that same level of commitment, to look toward the next 50 years to secure our future for the work that lies ahead. How might we position ourselves for those who come behind us? The specific goal of this campaign is to reduce debt by the time of our 50th anniversary in November of 2020 to the point where our revenue, which comes each month from our rented parking spaces, would be sufficient to make our monthly mortgage payments. This would secure THE NEXT 50. Future church budgets would then be free to be used entirely toward ministry and the work of the Kingdom. Our need for property would nearly be complete, freeing and empowering tomorrow’s BCOC to dream big dreams over the next fifty years about how our church might best meet the needs of our neighbors on the Southside and in the city of Birmingham. 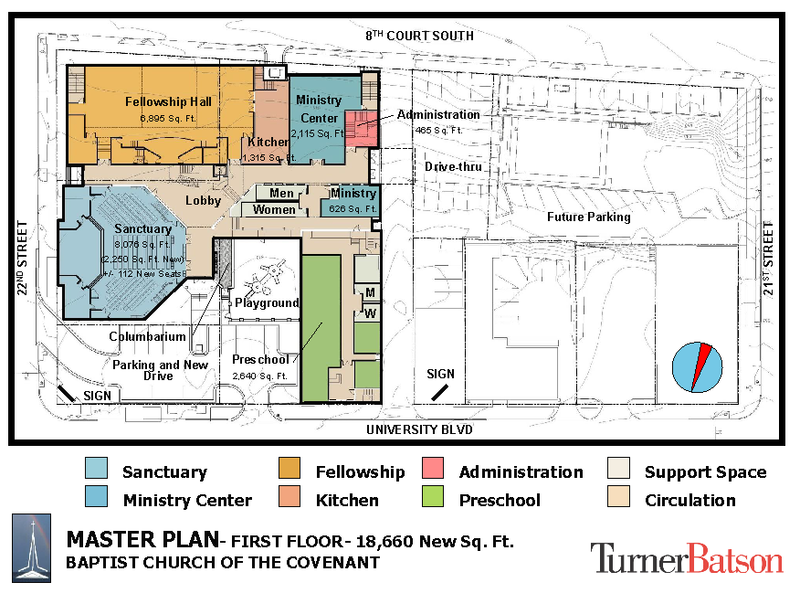 As we look toward our church’s golden anniversary in 2020, now is the time to help secure the next 50 as we work to pay for this property and eliminate much of our existing debt. Please join Sharon and me in making a commitment and/or gift through this pledge card. So I ask you to prayerfully consider what you and your family will give to this campaign - again, over and beyond your support to the church operating budget – in order to propel BCOC into the next 50. Thank you for your consideration and ongoing support of the life and vision of BCOC. 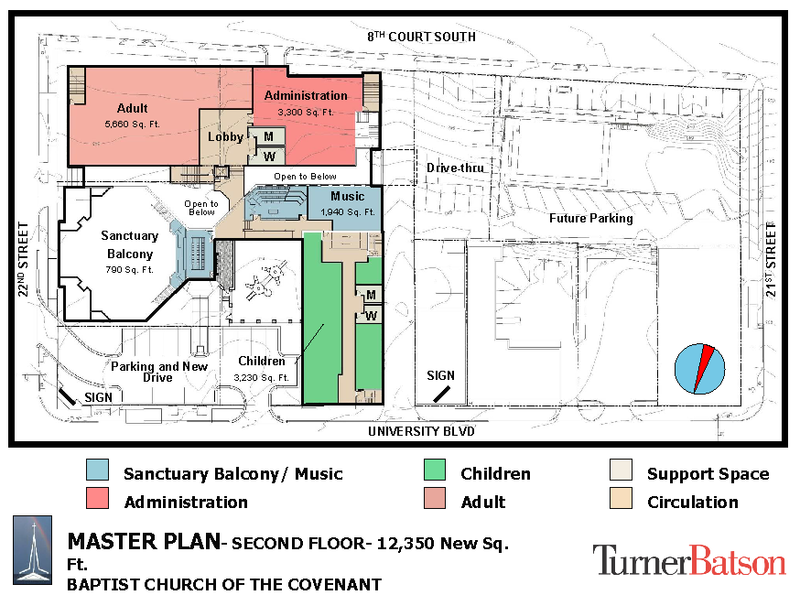 In October 2009, BCOC approved the plans below as our long-term master plan of expansion and renovation. If you have questions or concerns ask Jimmy Hawley or Patrick Chappell.